So this white grape sorbet, a counterpoint to the dark and boldly purple concord grape sorbet that I made last year, is the perfect therapy for this week. The sorbet is made from these absolutely beautiful green grapes that my mom brought me a few weeks back. 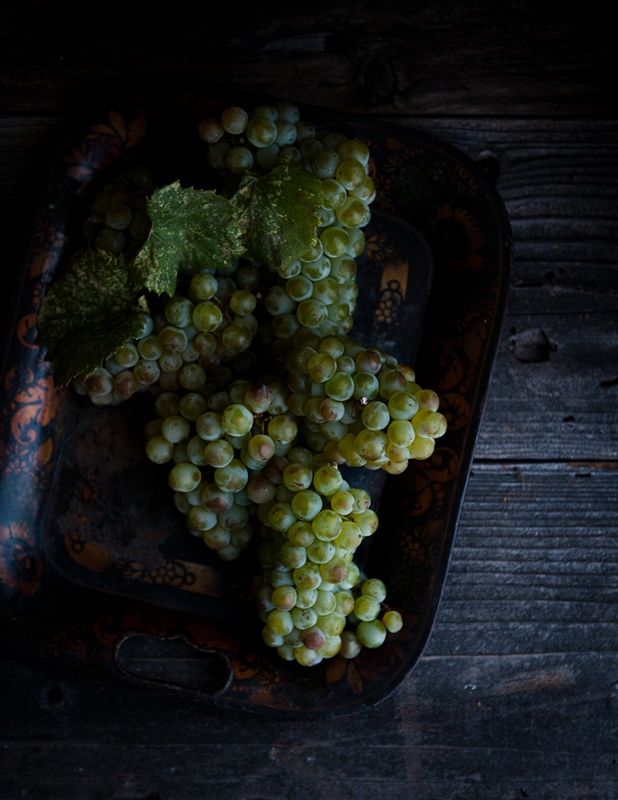 They were perfect and rustic specimens of grapes, slightly bruised light purple in some areas, clumped tightly together on the stems, with leaves still winding around the clusters and pockets of cobwebs hidden inside. I love it when I get grapes like this, which look real like how grapes fresh off the vines should look and not like the plastic-ky, cleaned-up versions of grapes that you see floating in cellophane bags in the supermarkets. 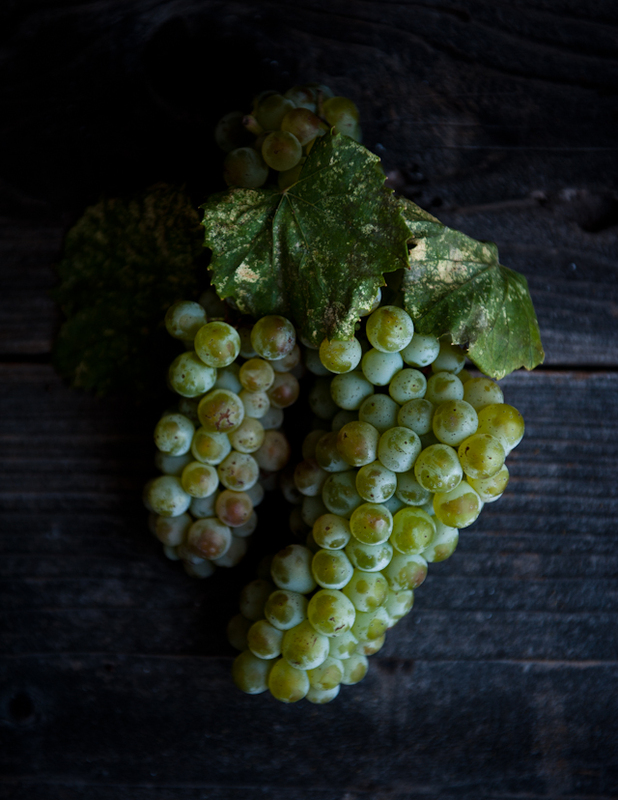 The grapes and the sorbet taste equally clean, with a mild sweetness, refreshing and quietly subtle. Wish me luck with this week--I'll see you at the end of it, if I survive! 1. 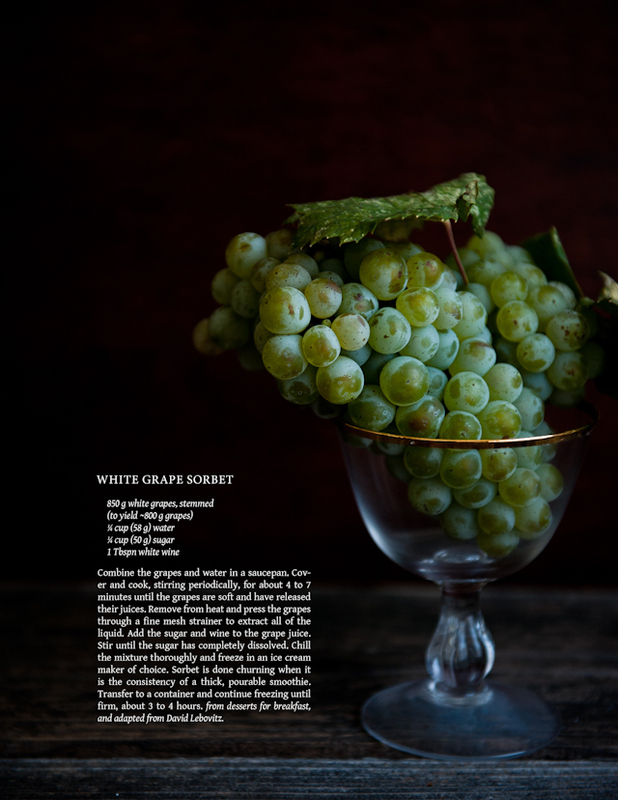 Combine the grapes and water in a saucepan. Cover and cook, stirring periodically, for about 4 to 7 minutes until the grapes are soft and have released their juices. 2. Remove from heat and press the grapes through a fine mesh strainer to extract all of the liquid. 4. Chill the mixture thoroughly and freeze in an ice cream maker of choice. 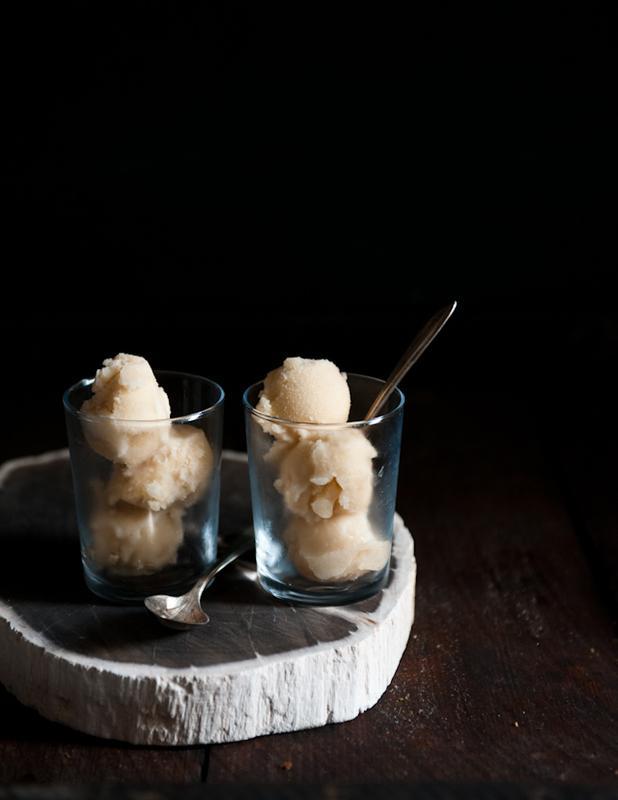 Sorbet is done churning when it is the consistency of a thick, pourable smoothie. 5. Transfer to a container and continue freezing until firm, about 3 to 4 hours. 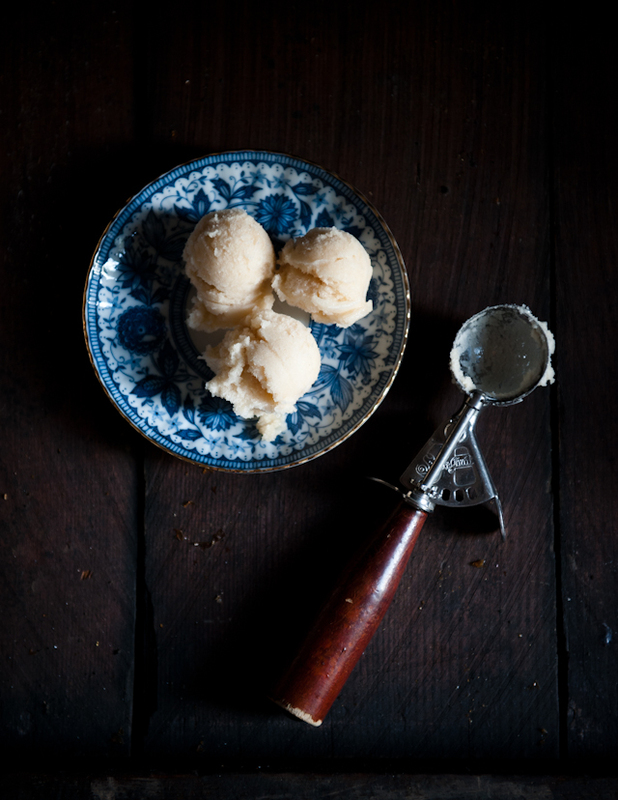 adapted from David Lebovitz with a nod to Jeni's Ice Cream for sorbet-churning tips. Such a beautiful, simple and fresh dessert!!! I say this every time I see your posts.. Such beautiful photographs.. Its such a joy to read your blog!! This is oh-so-lovely, Stephanie. The speckled leaves, lush green and deep dark background ...Love it all. Thanks for always inspiring with such delightful ideas and artful photos. Good luck with your presentation as well. Simple yet delicious dessert. REFRESHING!!! I love this. Such a fresh, light counterpoint to all the heavier dishes we're getting into as it gets cooler outside. What a nice idea. Fresh, pretty easy, perfect after a heavy meal.